If you live in Ontario, Toronto in particular, I think you’ll agree with me when I say this weather is crazy. Is it winter or is it the start of spring? It’s still cold enough that I’m more inclined to seek out warm, comforting meals for dinner, yet the balmy temperatures are making me yearn for the fresh flavours of spring and summer. 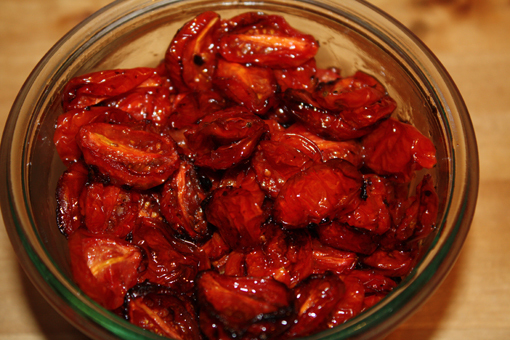 This oven-roasted cherry tomato recipe offers the best of both worlds. I cannot take any credit for this simple and delicious recipe – it comes from Heidi Swanson’s book “Super Natural Every Day”. If you aren’t familiar with her, I encourage you to go and check out her award-winning blog 101 Cookbooks or her other cookbook “Super Natural Cooking”. She is an amazing source for uncomplicated vegetarian recipes that use whole, fresh ingredients. For a carnivorous meal you can easily add a meat or fish protein to many of these recipes. 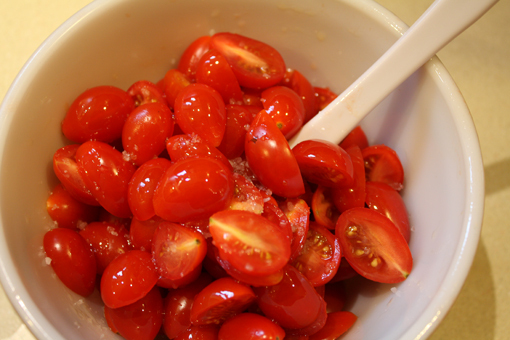 Tomatoes are an amazing source of antioxidants called carotenoid phytonutrients. One of the most well-researched of these is lycopene. Lycopene has been shown to protect cells, DNA and LDL (“good”) cholesterol from oxidating as well as to be extremely protective against breast, colon, lung, skin and prostate cancers. Most research suggests that lycopene is more bioavailable in cooked and processed tomatoes making this recipe an excellent addition to your healing foods repertoire. Tomatoes are also an excellent source of vitamins A and C which are powerful antioxidants. This recipe would definitely taste best when cherry tomatoes are in season, but it’s an easy way to maximize the flavour of what’s available in the winter months. Once made, this versatile condiment can be kept in the fridge for about a week and tastes amazing tossed with pasta, cooked grains, steamed green beans or anything else that might benefit from a hit of flavour. Step 3 – Drizzle with oil and sprinkle with salt. Mix well until tomatoes are well-coated. 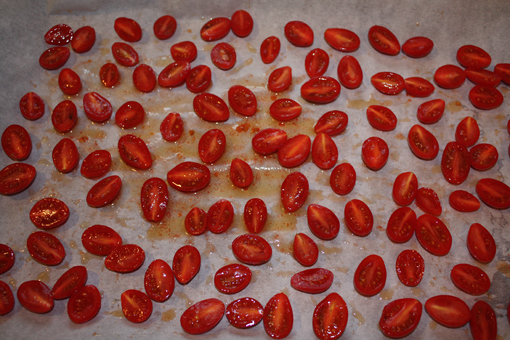 Step 4 – Dump mixture onto a parchment lined baking sheet and arrange so that tomatoes are cut side up. Roast for 45-60 minutes until the tomatoes shrink a little and start to caramelize around the edges. You can either use them immediately or let them cool and then scrape them, along with any oil, into a clean glass jar to store in the fridge. I love these tossed with cooked spelt pasta, sautéed leafy greens and garlic, and cooked beans (navy beans, romano beans, etc.) for a quick mid-week vegetarian meal. Enjoy!